Outgoing President of the Vineland Rotary Club, Ken Dondero, hands over the gavel to new President Maureen Simmons. The Rotary Club of Vineland held a special dinner meeting for the Installation of Officers for the club year 2018-19 on Friday, June 29 at Greenview Inn at Eastlyn Golf Course in Vineland, NJ. The dinner meeting was held in lieu of the club’s regular Tuesday luncheon meeting. 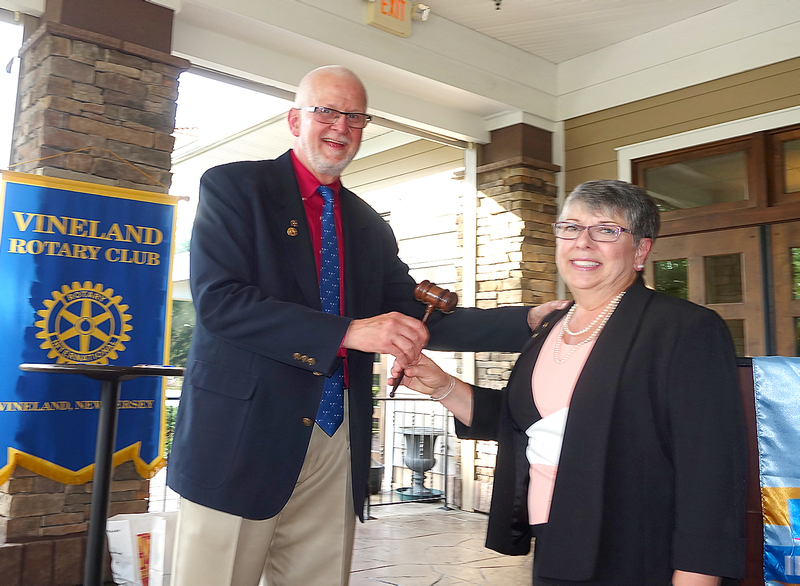 • Officers: President Elect—Frank Rumick, Vice President—Sherry Soutiere, Secretary—Linda Foster, Treasurer—Bonnie Laube, Charities Treasurer—Dave Schad and Immediate Past President—Ken Dondero. 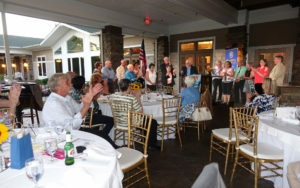 • Directors: Club Administration—Betsy Loyle, Community Service Co-Chairs—Sandy Forosisky and Maryam Nassiri, Foundation—Alan Dickinson, International Service—Shirley Burke, Youth Services—Nancy Hepner, Membership—Ed Morvay, Community Awareness—Mike Epifanio, and Sergeant-at-Arms Emeritus—Bruce Middleton. The Club’s new officers and directors are sworn in by former club president Ed Duffy, Esq. PHOTOS BY JAY PARKS. Incoming President Maureen Simmons asked the members to “Be the Inspiration,” which is the motto for the new Rotary year under the direction of Rotary International President Barry Rassin. The event was well attended and delicious cuisine, warm fellowship and music (the Mark Simmons Trio) filled the evening. Posted July 17, 2018 & filed under Rotary News.